For a man with many muses, it's nice to see that Karl Lagerfeld isn't opposed to revisiting an old favorite once in a while. For a man with many muses, it&apos;s nice to see that Karl Lagerfeld isn&apos;t opposed to revisiting an old favorite once in a while. To front Chanel&apos;s spring 2014 eyewear campaign, creative director Lagerfeld cast model/socialite/punk rocker Alice Dellal -- who previously appeared in ads (and a short silent film) for the French house&apos;s Boy bag in both 2012 and 2013. The new campaign, photographed by Lagerfeld himself, shows a much softer side of Dellal than we&apos;re used to seeing: Gone are her numerous tattoos, half-shaved head, and ripped tights, replaced instead by Easter egg pastels and some sweet little flowers tied into her hair. There&apos;s even a rumpled baby pink boucle jacket visible in the background. We&apos;re thinking the only thing that could possibly make the whole scene any sweeter would be a co-starring appearance by KL&apos;s other long-standing muse, little Choupette. Which, speaking of -- isn&apos;t it about time she got her own Chanel campaign? Is Alice Dellal the New Face of Chanel? 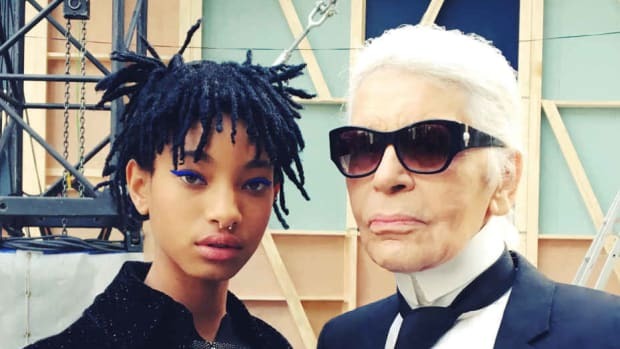 Karl Lagerfeld does not shy away from quirky ladies to front his Chanel bag campaigns: Lily Allen was a recent face, as was the more model-esque Blake Lively. But Karl definitely has punk proclivities, as evidenced by his new harder-edged, lower-priced Karl line; perhaps his immersion in that recent project explains his rumored choice for Chanel's next bag lady. Karl Lagerfeld's latest muse gets her first print gig for the brand.